Discussions Magazine Music Blog: SPAZ reviews FRONTIER RUCKUS' album Eternity Of Dimming! 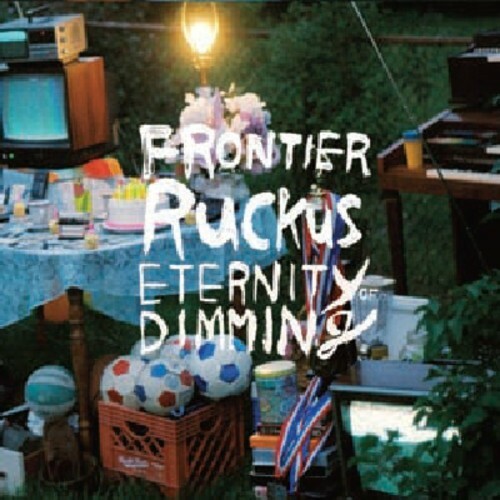 SPAZ reviews FRONTIER RUCKUS' album Eternity Of Dimming! Let's get a few things straight, OK? 1. I am not a fan of the whole Americana/Roots/Y'alternative movement. Much of it bores me: always has, always will. I think that a lot of young bands choose the Americana route because they are unable to write a decent hook to save their lives... and they look like they don't enjoy shaving or bathing. 2. I am not a hipster, nor do I pretend to be. I don't need a certain magazine, radio station or website to tell me what to like. I like what I like. (Then again, I use a blog to try to encourage others to listen/buy what I like, so I consider that a bit hypocritical). 3. Sometimes, hipsters can physically resemble an Americana musician. The only way you can tell them apart is that hipsters pay decent money to look like they don't enjoy shaving or bathing. 4. Even though I don't care for Americana and I'm not a hipster, I will still give every band and musician a chance. If it doesn't tickle my fancy, then it doesn't deserve another spin. But if I hear something I like, then I'll load the CD into iTunes then listen to it on my iPod. When I first received a copy of Frontier Ruckus' Eternity Of Dimming, the first thing that made me want to give it a spin was that it was a two CD set. If a band decides to release a double album, then that automatically piques my interest. Double albums have a 'cool' stigma attached to them, so I obviously wanted to see what the band had to say... and it sure sounds beautiful! Matthew Milia, the Michigan-based musician behind Frontier Ruckus, creates a world filled with melancholia and wonder. The songs on Eternity Of Dimming are filled with simple beauty and warmth. All the trademarks of Americana are here yet the songs transcend any genre. The melodies are slow burners, rarely hitting their mark immediately. Instead, they snuggle up to you and worm their way into your very being. Like Roddy Frame did with early Aztec Camera, Milia's songs eventually make their mark and make you feel as if they have existed for generations. As a lyricist, he turns the average into extraordinary. The little things in life never sounded so important, so real and so big. His vocals have a hint of Devandra Bahnart, Michael Stipe and Neil Young, but there's a charm and innocence that sets him apart from the average singer/songwriter. Not once do you ever get the feeling that he is detached and going through the motions. The songs seem like they are ripped from the pages of his personal journal. He's a poet with a knack for writing lovely tunes. Highlights on the album include "Birthday Girl", "Black Holes", "Careening Catalog Immemorial", "Surgery", the title track and so many others. Sometimes, when I write a review, the hardest albums to write about are the ones that I FEEL and not just HEAR: this is one of those albums. I could go on and on about each individual song, but it wouldn't do the album justice. The songs work when taken out of context with the rest of the album, but all 20 tracks conspire together to create an album of exquisite beauty. I'm a fan. In fact, this album has altered my perception of Americana and I will now approach more artists with less skepticism. That's a pretty big deal for me. But no worries, I still plan to bathe and shave...just not as often!